Japanese Institute of Space - Universe Galaxies And Stars Section. The Japanese Institute of Space and Astronautical Science has succeeded in launching and deploying the first ever solar sail into space. A solar sail is a thin metallic film pushed by light from the Sun - like a sail on Earth is pushed by the wind - it requires no engine. The 7.5 micrometers thick sail was carried on board an S-310 rocket launched from the Uchinoura Space Center, and deployed at 122 km (75 miles) altitude. 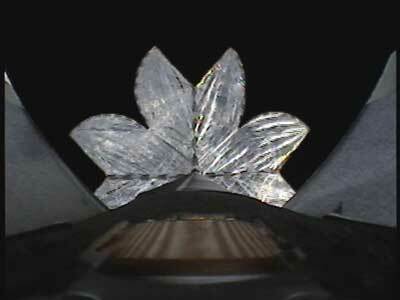 ISAS succeeded in deploying a big thin film for solar sail in space for the first time in the world. ISAS launched a small rocket S-310-34 from Uchinoura Space Center in Kagoshima, Japan, at 15:15, August 9, 2004 (Japan Standard Time). The launch was the culmination of a historic new technology, the world-first successful full-fledged deployment of big films for solar sail. A solar sail is a spacecraft without a rocket engine. It is pushed along directly by light particles from the Sun, reflecting off its giant sails. Because it carries no fuel and keeps accelerating over almost unlimited distances, it is the only technology now in existence that can one day take us to the stars. Although both scientists and science-fiction authors have long foreseen it, no solar sail has ever been launched until now. It is because superlight material for thin film which could bear extremely critical environment in space. Now due to the development of material and production technology, we can utilize promising film materials for solar sail, and the experimental deployment trials toward realization of solar sail have been initiated in some countries. The S-310 rocket which was launched from Uchinoura Space Center at 15:15 of August 9, 2004, carried two kinds of deploying schemes of films with 7.5 micrometers thickness. A clover type deployment was started at 100 seconds after liftoff at 122 km altitude, and a fan type deployment was started at 169 km altitude at 230 seconds after liftoff, following the jettison of clover type system. Both experiments of two types deployment were successful, and the rocket splashed on the sea at about 400 seconds after liftoff.